Rick began his career in banking in 1971 at First National Bank of Oregon, which became a subsidiary of First Interstate Bank. He rose from Management Trainee to Executive Vice President and head of Corporate Banking. In 1982 he moved to First Chicago where he headed Community Banking. In 1991 he was elected Vice Chairman and Director at Union Bank and was in charge of Community Banking. Retiring from Union in 2005, he joined US Bank in Minneapolis as Vice Chair and head of Consumer and Small Business Banking. He retired from US Bank in March, 2013. Today he serves as a Director of Freddie Mac and has been elected Non-Executive Chairman of Synchrony Financial (NYSE-SYF) the spin out of the North American consumer finance business from GECC. 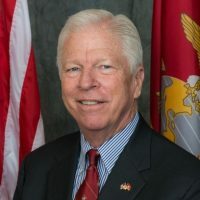 He also serves as a Director of the Marine Corps Scholarship Foundation, the Marines Memorial Association and is active with the Marine Corps Heritage Foundation. During his banking career he served as a Director of the 12th Federal Reserve District, was a long time Director of MasterCard’s US Region, and served on the Boards of the Consumer Bankers Association, Bank Administration Institute, and several state banking associations. He received a BA in Economics from UCLA and an MBA from Stanford University. He is a veteran of the US Marine Corps and flew 220 combat missions in SE Asia during the Vietnam War aboard the F-4B aircraft. He lives with his wife, Dail, at Black Butte Ranch in Central Oregon. They have 3 grown children and 6 grandchildren.